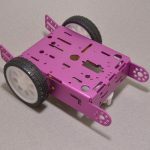 This chassis base plate is a round piece of Red 1/8″ (3 mm) acrylic with a 5″ (127 mm) diameter and cut-outs for building a differential-drive robot. 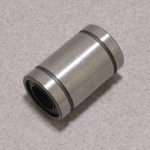 The chassis has assorted general-purpose holes and slots that support many configurations of sensors and other robot components. 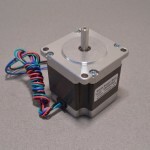 Our micro metal gearmotors, Wheel 42x19mm Pair, and extended brackets are a perfect fit for this chassis. SKU: ROB-039. Category: Chassis. Tags: Chassis, Light Packet, Robotics.